And now for something completely, radically different! 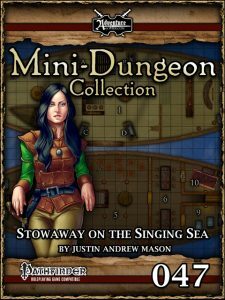 This adventure takes place mostly with the PCs cooped up in a crate, with rations, portable hole for…ahem…necessities. Two weeks. Even if you fast forward that, it’ll be interesting if you just briefly mention each day and wait for your PCs to interact a bit. I’m serious. If you have good roleplayers in your group, this’ll be pure gold. That being said, there is a reason for this unorthodox way of travelling. You see, the PCs have been hired by law enforcement to catch captain Elloise Drake in the act, with the means of granting her crew amnesty. Thus, they stowed away on her vessel…and once the crate’s opened, the PCs explore the pirate vessel, catch it in the act of piracy and may use their social skills to make more of the crew turn against their captain. And yes, furious fight included. Sure, you can play this as a fast-forward one-big-encounter type of scenario…but if ran as provided, it can actually provide easily a full gaming day’s worth of fond memories. Editing and formatting are very good, I noticed no significant glitches. Layout adheres to a beautiful 2-column full-color standard and the pdf comes sans bookmarks, but needs none at this length. Cartography is full color and surprisingly good for such an inexpensive pdf. The .tif version included here, which you can easily cut up and hand out to the players as they progress is a huge bonus -and even better: A KEY-LESS VERSION sans the annoying letters/numbers is included as well for full VTT-compatibility!!!. The pdf does sport one nice piece of original full-color art – kudos! In fact, if it has one neutral weakness, that would be that exploration of the pirate vessel does not really yield advantage when turning the crew – some one-sentence angles for key-crew-members to turn them would have been the icing on the cake. Still, this represents a great example of how cool a module you can craft even with a minimum of space. 5 stars. You can get this cool mini-dungeon here! While my review’s based on the PFRPG-version, you can find the 5e-iteration here!